CV - who am i? What permaculture design method to use here? I want something to reflect the starting from scratch start up and the journey. CEAP gathers lots of information. SADIMET and OBREDIMET could work but I want a process to follow that is a bit more about process. - I thought of Dragon Dreaming as it describes project management and getting a long list of things done in a friendly simple group process. I had experience with this once and it stuck with me as being something to retry and a helpful way to be systematic and design the process. I accept that what I come up with will only be my take on Dragon Dreaming so please excuse that. Ethics above not so far removed from Permaculture Ethics of People Care, Fair Share and Earth Care? 4 STAGES: - not so different to OBRDIMET or SADIMET? 1) THE DREAMING - How do we make dreams come true? 2) THE PLANNING - People do not "plan to fail" just "fail to plan". 4) THE CELEBRATING - This is built upon gratitude and thankfulness, acknowledgement and recognition. It is celebration that connects the doing of a project back to the original dreaming. Consider now the statistics. In our conventional world of win-lose competitive enterprises, of every 1000 dreams, only 100 become plans, only 10 plans work according to plan, and only 1 survives longer than three years. People know this…. they know in the conventional business as usual world, dreams do not come true, and so….. so they give up their dreams. Aboriginal people in Australia say that when you lose your dreaming you have lost part of your soul. And the symptoms of soul loss are all around us – apathy, fatalism, powerlessness, living only from day to day, addictive behaviours, seeking happiness through consumerism, easy frustration, blaming the victim in others or oneself, rising levels of depression. Dragon Dreamers know we need this fourth step. I can see the links with Permaculture and the Transition Movement in this attitude and I like it. right livelihood for me and others. community gardens started or better used. clarity of what Herbaculture is trying to do. business admin leading to being operational. space for other aspect of life to continue and flourish. find people to share the dream with. experience 'Herbaculture in action'. evaluation, promoting and expanding. Retain ethics and principles at the heart of everything. 1) clarity of what Herbaculture is trying to do. 5) business admin leading to being operations. 8) experience 'Herbaculture in action'. evaluation, promoting, celebrating and expanding. 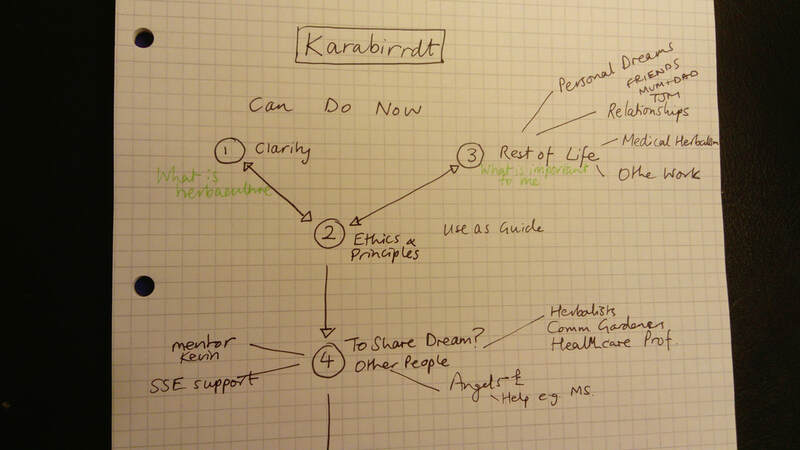 The central tool for the Planning stage (and later the Doing stage) is the strategy of the Karabirrdt. The word comes from the Noongar Aborigines of Western Australia and means spiderweb. A Karabirrdt is a literally a “board game”, a project plan, a guide, and a map of the territory all at once. It helps to playfully and intuitively take care of all tasks and to budget them. The Karabirrdt is also the gateway from theory to practice. The redrawn karabirrdt showing the order to do things. ​The Karabirrdt also helps to cross the threshold to the doing stage. It helps to stay focused during the whole process of the implementation: who has started which task, and which task has already been completed? By answering what is still needed to make our (collective) dream come true? Very often a project team realises that more than a hundred percent of their dream has come true, and often in ways that they could never have imagined. As we come to realise our dreams, it is time for celebration. Yet we often forget to celebrate. We think that there isn’t enough time, that there isn’t enough money. But when we celebrate (and dream), we replenish our valuable creative energy. Those who always move from the doing directly to the next planning, will sooner or later burn out. We say 25% of every project needs to be celebration, and that we need to celebrate all the way through. end of project goody bags? celebrating gives great promotional pictures. Celebrating gives time for evaluation and reflection and funders can be invited. e.g. No. 4 find people to share the dream with and invite them to celebrate with me. e.g. No. 8 Reflections is well done with a glass in your hand. ​Much of my life ideas and designs relate to my herbaculture plans. 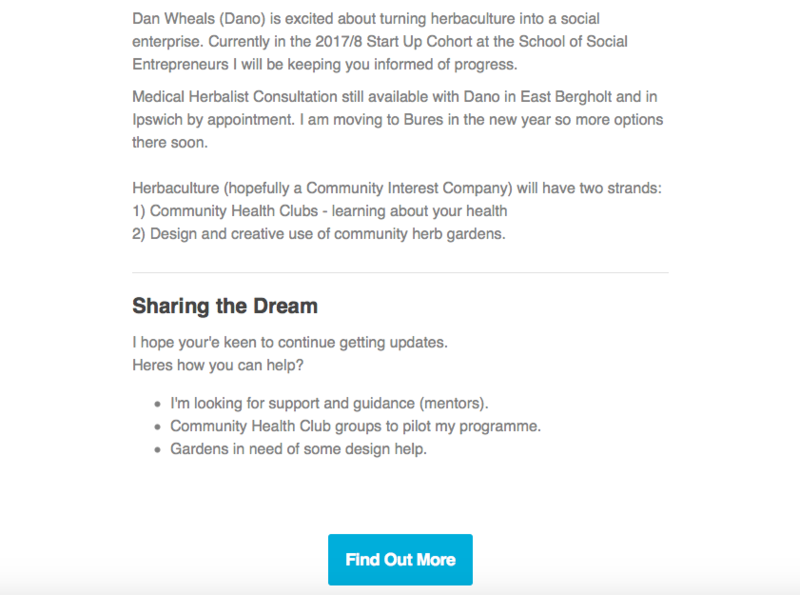 I realise I am missing a clear vision of what I dream herbaculture can be for me and for my aspirations of a social herbaculture. There have always been clients, workshops, educating groups about herbal medicine and community engagement. 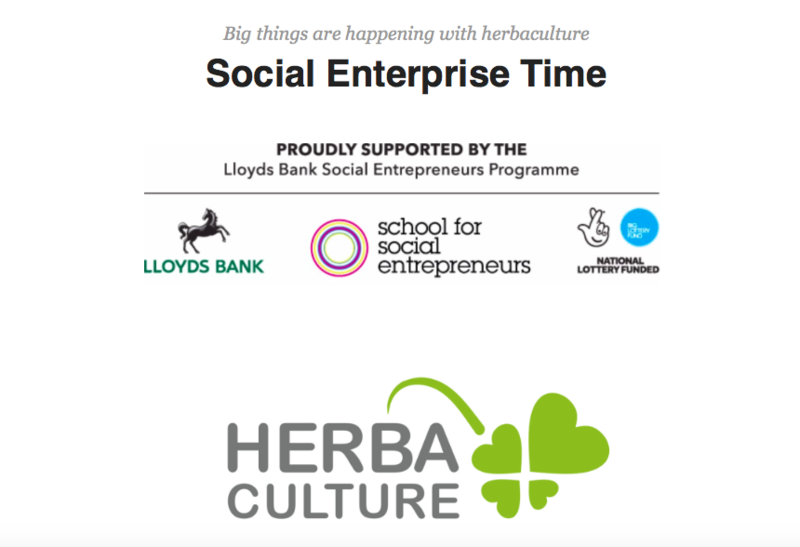 Since starting the School for Social Entrepreneurship in Oct 2017 I am going to make a plans for me as a herbaculturalist and for herbaculture the social enterprise/ charity and meme. N.B. Insurance about remedies and herbal medicine need to clearly be outsourced to Dano the medical herbalist. short courses on wellbeing and herb growing. non Medicines sold online: links to other websites etc so no stock held. ​blog style links to products and other ranges with links to commission on sales? N.B. 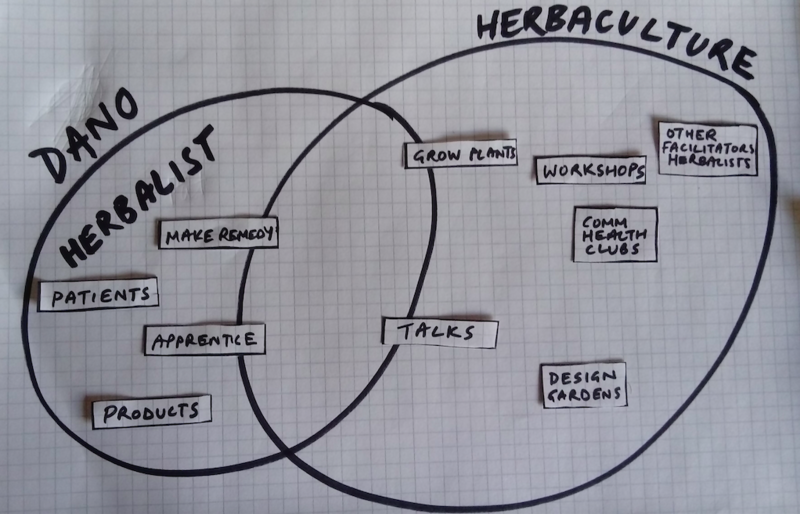 By taking talks, walks and workshops into Herbaculture it simplifies the herbalist role and makes education and inspiration part of herbaculture. Basically anything not medical. So although plant growing could be seen as a personal thing I think it is best be clear that it comes under Herbaculture too. new ideas? Had the idea to redo this with regard to Business Admin once there. Ethic banking etc. How did it go? The key points from the Table below are gardening skills as part of health awareness to link land and person, have no perceived financial barriers to taking part and make sure the health benefits are captured and stored to "shout" about the benefits of herbaculture. I feel that this exercise didn't tell me anything new but I will repeat it again and aim to continually revisit it. I am keen here to be aware of areas of my life that need to not be forgotten in the Herbaculture CIC plans. Using the Triple 000 tool below to get a handle on the areas of my life. 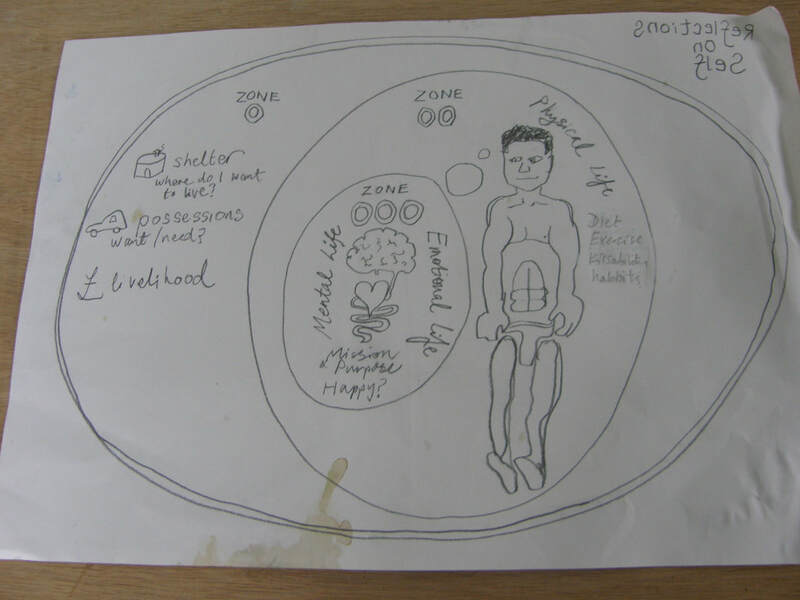 ZONE 000: Mental Life, Emotional Life and Mission/ Purpose. Social life: Visiting/ contacting family & making time to see Friends. 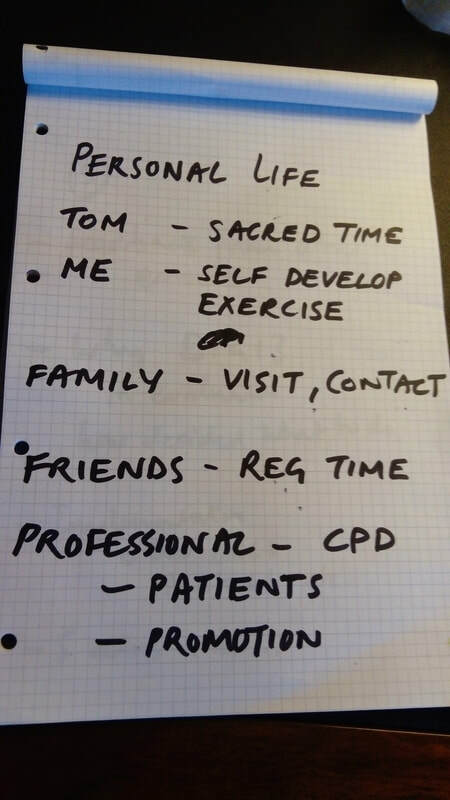 Professional Life: Not losing sight of my personal business with patients and CPD. All in All I need to be aware of my health, my social/ emotional bonds and to ensure 'my thing' (being a herbalist) is a big part of my life. Nov 2017: So work in swimming, special time with partner, family and friends and try the online herbal medicine course that is being offered by my institute. Revisit this regularly to check all is well. I included this as the dragon dreaming process has a lot to do with groups and their interaction saying "a dream stays a dream unless it is shared". I also am aware that a minimum of three people is needed for some forms of legal structure. On the Social Enterprise course I am doing there were some great examples of charity trustees being the biggest sources of free advice and guidance and why wouldn't I want that? The nature of a social enterprise is it is social but having been in a co-operative I realise how much it could slow me down and dilute my vision having others with me who have other ideas. So far this had been my idea alone and I also want to make this my way of making an income but I owe it to myself to explore how I can share my dream. Other herbalists via facebook and NIMH. Community gardeners via Thrive and umbrella organisations. Community gardens/ locations in my area. Advisory organisations like Community Action Suffolk, Eastern Enterprise Hub etc. Health Professionals such as doctors and nurses and specialists. Community champions who make things happen in their areas. Partner organisations such as MIND, ActivLives etc. Individual supporters who need to be kept informed. Social Entrepreneur Peers on my course. How will I get in contact with these people? At what stage in Herbaculture's development? Is there a right time? Will it change how I view the legal structure? Initial step is to collect as may people as I can and share where I am? I have to explore my Mailchimp mailing list and point as many interactions with the above people to signing up. Explore updates on Facebook too but feel less excited by that and add a link on my email signature. Using my old mailing list of over 220 people I got teo immediate replies, one saying fab...... and another saying they could offer accountancy tailored to CIC and linked me up with a local CIC doing nature inspired garden designs - exciting. I can celebrate the launch of herbaculture CIC and milestones along the way. The diploma accreditation is a big one......AUSTRALIA HOLIDAY MY CELEBRATION. The sending off of my CIC forms. AUSTRALIA HOLIDAY MY CELEBRATION. SSE offer free hire of their spectacular room which could serve for all three.... ONCE SET UP! AN OFFICIAL LAUNCH. This is the big sections and I will use the sub pages to help here. ​7.2 A Website and Digital Strategy including Marketing considering what websites I might need. I will be taking this to my Business Mentor from Lloyds Bank and working out what my next steps might be. based on more funding options as a not for profit. Which fits my ethos ideas better and does not stop me earning a living. bank options looked at, favouring Cooperative Banks Community Direct but need other signatories. UnLtd bid in. Jan 5th! submitted. Update got to final round and will pitch in London on 31st Jan.
a) growing herbs EXPLORE VENUES FOR NURSERY, FOR NOW MY ALLOTMENT. I have at least 4 local people doing their apprenticeship and I have emailed them with plans to run workshops in Spring 2018. Heartwood are interesting in clinical supervision I could offer as well. HAS THE DESIGN DONE what it SET OUT TO DO? Have the design solutions worked? Realised my goals for Business planning? I really enjoyed using the dragon dreaming process. This helped me get over my blocks. Scope for diagrams from this design to accompany the text in my business plan. ​From This Pattern to the Detail in the next designs. Where AM I AT IN TERMS OF PERMACULTURE DESIGN? How would I use these tools differently next time? I would try and learn a bit more about Dragon Dreaming... my only other experience was on one sheet of a4, coloured pens and 7 of us painting the signs for the International Permaculture Convergence in London. I think it's worth a try to get familiar with this method. I found the structure of Dragon Dreaming very useful. 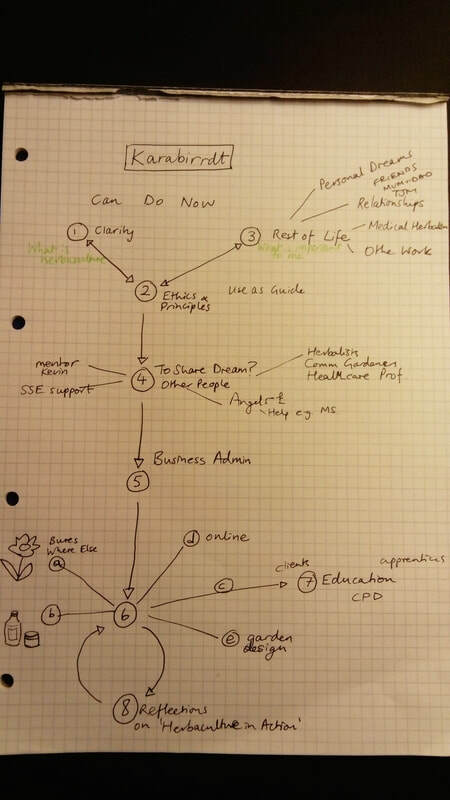 Im not sure that it is that different to standard business planning but it seemed more fun especially with the flow chart...... and trying to follow it. What tips can be learnt here: Spend time on the dreaming and the planning and then the doing takes care of itself. Would I do it this way in the future? YES, I can see it could relate to Critical Pathway Analysis.